I am notoriously bad at keeping on top of, and up to date with series, and as such, it is not often that I’m actively looking forward to an upcoming release (as I usually have plenty to tide me over before the next book comes out). I’m also not very good at keeping on top of when new books are being released, so this ought to be interesting – I actually had to check my preorders on Amazon to help me formulate this list. The first seven I am actively excited for in one way or another, and the final three I have pre-ordered, but have yet to read anything by the authors. This is my single most anticipated release of the whole of 2015, never mind just the last six months! I will devour anything J.K. Rowling/Robert Galbraith/any future pseudonym releases, and they will (for the foreseeable future) always be my most anticipated releases! I read ‘Fangirl’ last year, and enjoyed it, but weirdly (since it’s based on Harry Potter) didn’t enjoy the Simon Snow fanfiction sections, but I’m sure I’ll enjoy it when it’s a solely fantasy based book, rather than blended with contemporary. Despite (at present) only having read the first two ‘Percy Jackson’ novels, I anticipate (someday) getting through all Rick Riordan’s books. He’s a great storyteller, and his plots are brilliant, so I know I’ll love this (and the rest of his books) when I finally get around to reading it/them. Despite still having ‘The Assassin’s Blade’ and ‘Heir of Fire’ to tide me over before the its release, I’m pretty sure I’m always going to be excited for a new Sarah J. Maas book! At this point in time, I’ve read more Sarah J. Maas books (3) than any other author in 2015, and she’s absolutely a new favourite author. Despite not really liking the only Giovanna Fletcher novel I’ve read to date (‘Billy and Me’), I’m quietly hopeful that on her third attempt, she’s produced something that feels more complete. I love her as a person (her vlogs are adorable) so I hope I love this book. 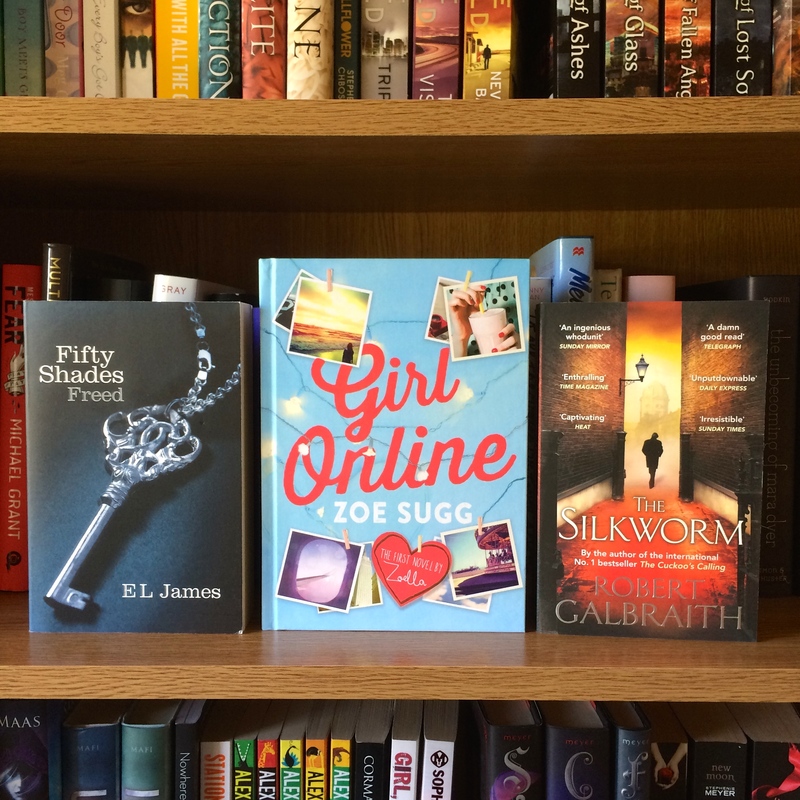 I unexpectedly really enjoyed ‘Girl Online’ when I read it in January, so I’m excited to see where Penny and Noah’s journey continues with the second installment. Even though it’s for a primarily younger audience, I still found the first book entertaining and I flew through it. It was only announced this month that ‘Fifty Shades of Grey’ was getting an accompanying book, in the form of ‘Grey’, which is told from Christian’s perspective. They might not be the best written books, but they are certainly entertaining, so I’m excited to get into Christian’s head. I’m ashamed to say I’ve yet to read anything by Marie Lu – I really need to change that, as I’ve heard amazing things about the ‘Legend’ trilogy, and the first book in her new series ‘The Young Elites’ – ‘The Rose Society’ is the sequel. I think I may end up marathoning her books over the autumn/winter. Despite all the hype about this series, I’ve yet to delve into ‘Cinder’. ‘Winter’ is the final book in the four book series (plus an accompanying volume), so I should probably read them before the opportunity to get spoiled by the conclusion is possible. I’ve had ‘Snow Like Ashes’ on my TBR for a while, but it’s just one of those books I’ve yet to pick up. It has had some amazing reviews, so I’m looking forward to finally getting to it, so I can continue on with the series with this second volume. I’m in the same situation as you regarding Snow Like Ashes. A hyped book last year that I wanted to read but still haven’t found a chance to and now another year rolling around means the sequel ahh. I hope we both get a chance at it! The Rose Society is on my list too. I loved The Young Elites. I hope you like it too when you get around to reading it. Great list!